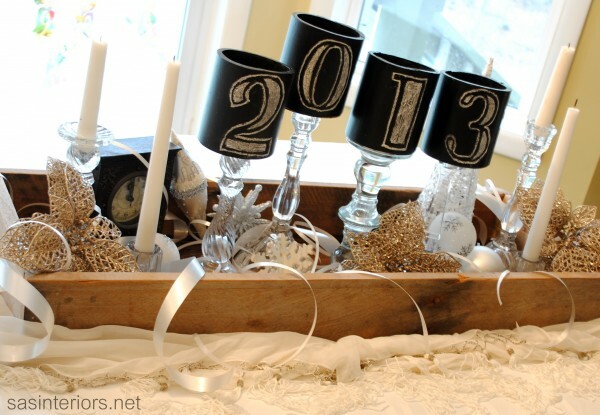 A Sparkly New Year’s Eve tablescape is in store you today Lovelies! As New Year’s Eve is tomorrow, (Gosh where does the time go?!) we wanted to show you some lovely tablescapes you can do for tomorrow! We are in love with this amazing one that is a totally DIY look! The 2013 chalkboard cylinders are actually pvc pipe that Sas Interiors painted and then drew on. Put them on candle holders and voila! We love the color pallet of white and gold too. Anything with gold in our eyes is definitely New years’s eve themed! All the snowflake details are just darling too. All of the candles added in will really make this an intimate space!